The resort offers spacious, comfortable two-room suites with splendid views of the surrounding hills; 27 holes of championship golf, a relaxing spa and contemporary American dining. Located only 2.5 miles from Spring Green. With its beautiful surroundings, the Resort offers two facilities for weddings and events. 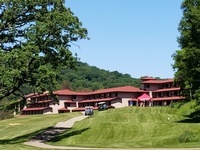 The Wintergreen sits on a bluff and has spectacular views of the Wisconsin River, and can accommodate 250. The Resort itself has reception facilities for 110.